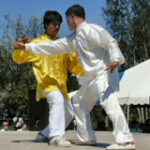 Master Peng & Grandmaster Wang doing push hands at the Thunder Bay International Taiji Festival in 2001. 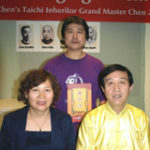 Master Peng with Chen Shimu and Grandmaster Chen Zhenglei. 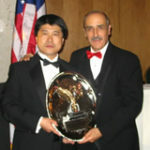 Master Peng was inducted into the Budo International Magazine Martial Arts Hall of Fame in June, 2006. He is pictured here with Grandmaster John Pelligrini. For a number of years Peng Youlian has been invited, by his student, Shifu Daniel Corona, to give workshops at the Shaolin Temple Mexico.